The 225W IJOY Captain PD1865 TC MOD is powered by dual 18650 batteries, and the maximum output power is 225W. The Captain PD1865 Mod is 0.96 inch OLED screen, with 510 thread and it supports VT(Ni/Ti/SS)/TCR Mode and Firmware Upgradeable. 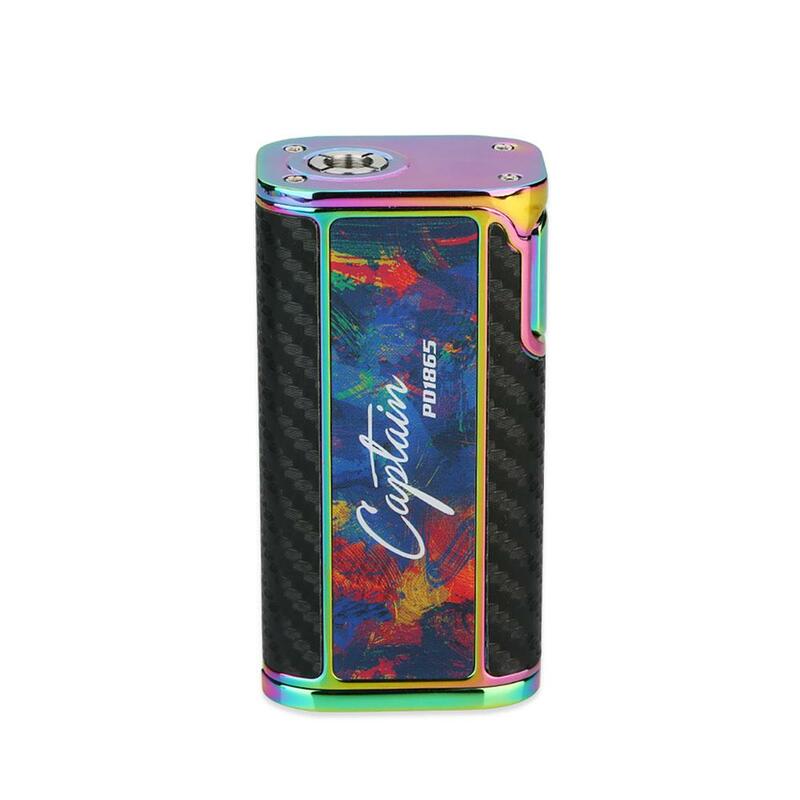 The 225W IJOY Captain PD1865 TC MOD is compact size for easy carry, powered by dual 18650 batteries(not included, and you need to purchase the 18650 batteries saperately). It is the 510 thread and maximum output power is 225W. Massive 0.96-inch OLED screen shows the data more clearly and the Captain PD1865 mod supports VT(Ni/Ti/SS)/TCR Mode and Firmware Upgradeable. The device can be charged via USB port and it will be your best choice if you want a compact size mod with more functions. • It doesn't come with battery. You need buy 18650 batteries separately. The item arrived within two and half weeks via Singapore post counting the day of payment and local transit. After completing the payment and confirming the payment the items are usually shipped immediately or max within 24 h. As usual they are informing the client in every step since shipment of the order via email. The price was unbeatable in Buy Best especially in ''Flash Sales'' and the quality is always high, the item beside original package is repacked for shipping in bubble warped envelope and in my past six orders there wasn’t any issue considering the package. They are respecting the clients via many stimulating programs such as Point Program from every order or Review :), 10 points for daily check in, invite your friends to register and put an order 500 points. Points will expire at the end of the next year but with unbeatable prices on ''flash sales'' or ''sale items'' or ''GROUP Buy'' they will be spend for not so long time. In every major holiday or national day they are offering discount coupons mainly for their subscribers, also there is a new ''flash sale'' items and many promotions offering discounts. The important thing in this place is that every order above 20 usd has free shipping, you are receiving bonus points and if there is promotional coupon you can also apply it. As i mentioned the shipping is via Singapore Post and at the moment they are always reliable, the shipping is fast with almost no errors. Always when I’m purchasing the items i prefer the shipping carrier to be reliable quick even if item cost a couple bucks more is worth to spend that amount and to invest in security and quality. After sale support according to need and fast response in email questions and client caring programs the after sale should be pleasant experience and solved in friendly manner. From my experience in many years purchasing from various sites and many written comments, critics, opened disputes, appeals, reviews, based on my personal and professional experience the customer satisfaction and solving the client issue on fastest possible way is essentially. The fair politics and lowest prices for products that are attractive, offering the best prices on market and all this combined with fast economical shipping caring for clients and subscribers the BuyBest is one of the stores that have fertile future. The fair politics and lowest prices for products that are attractive, offering the best prices on market and all this combined with fast economical shipping caring for clients and subscribers the BuyBest is one of the stores that have fertile future. This mod is compact and portable. I especially love the OLED screen which makes everything way much easier and convenient. I bought it when they offered a big discount. The performance is amazing. Recommend it to the rest of you. This rainbow mod looks quite stylish and unique. Really love the design. The price is also good enough for me. One of the best mods ever if you think quality-price ratio. Cheap, simple, nice to hold, good 510, good battery door. I've had on Captain with me almost a year and still runs likes a charm! Красиво. Цвет мне понравился. Спасибо Buybest за быструю доставку! Very good mod! Just like the bigger Captain PD270, solid device! I have recived my product but I waited for it about 2 months and thats a big - . Comunication with customer service was very good. Product looks awesome. Awesome Ijoy product I ever had! fast delivery and fancy product! Can't ask more!!! It's getting to be my fav now.